In loving memory of my boy "Trevor". You may be gone, but you will live forever in my heart. Have you ever had a special dog in your life that touched your heart in a certain way that none before him ever had? I had the honor to have just that dog in Trevor. We had a special connection, even though there had been dogs that I loved before him he was just 'special'. Sometimes I think he knew what I was thinking before I did! 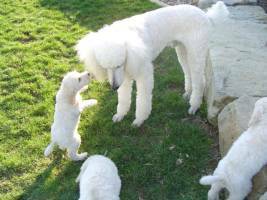 I searched a very long time before I decided on adding Trevor to my dog family, I was looking for something special and I found him at a wonderful breeder in the Carolina's with 45 yrs experience in breeding and showing poodles, I had not met him but purchased him thru photo's, pedigree's and lots of phone conversation with Helen his breeder. Trevor was 4 months old when he arrived here, we had never seen each other and I was a little worried about bringing home a 4 month old into our fold of farm life. The day Trevor arrived I picked him up at the airport and brought him home in the carrier, he had never met me so I didn't open the crate until I got safely in the house, when I opened that crate door I literally burst into tears-he was the most beautiful thing I had ever seen in my life! I knew he was worth the wait and all the searching. Trevor went everywhere with me. He was a big boy and we always got alot of looks when he rode right up front in the passenger seat looking out the window, soaking up all the sights. In his short 4 yrs of life he was never more than three feet from me. He tolerated little puppies hanging on his ears and swinging from his tail. He touched noses with the barn cats every morning and tip-toed around our old ducks. My son who was premature and very small learned to walk holding onto to Trevor's fur. We had an old tree stump at the back of our first soybean field near the treeline and every morning while I fed the horses Trevor would trot back to the stump where we feed the wild animals to see what deer and turkey had came thru the night before, then like clockwork he would do his business on that stump as if to say "Hey this is my stump-there will be no free meal here!" I'd call him when it was time to go back in the house and he would burst into a full run to come to me-something Trevor only did at that time of day-he was a very mellow kinda guy. Life is full of wonderful things and Trevor gave us all some very beautiful puppies to carry on his beauty and charm. I lost my Trevor in the middle of the night, I never got to say goodbye, he was just gone in the morning from gastric torsion or bloat as it is sometimes known. I buried Trevor by his tree stump, I like to think he is still checking out who is coming and going every evening and watching over us all, one day I feel we will meet again. Not gone, just gone ahead. 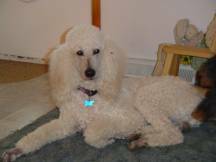 I had the pleasure of owning the most perfect dog in the world with Chauntae, she was everything I wanted in a Standard Poodle, she was beautiful, intelligent, loving, well behaved.....well except for her sweet tooth! One Christmas my mother made my now husband a tin of yummy Buckeyes (peanut butter balls covered in chocolate) Chauntae managed to get the tin, open it and eat the entire batch! So much for that gift! Her sweet tooth also got her into trouble when she learned how to open our pantry door and steal entire packages of cookies, take them to our guest room downstairs and devour them! I thought my kids were going thru way too many cookies until I discovered her stash! Chauntae was an excellent judge of character and when I met my husband I took her on our first date, I trusted her opinion entirely, a girl cannot be too careful these days! He passed with flying colors and when we married 5 yrs later she of course was in our wedding party. Chauntae was with me for 15 1/2 wonderful years and I miss her dearly, all I can say is that I hope there is a pantry full of unlimited sweets for her in doggie heaven! Until we meet again my sweetheart, until we meet again.